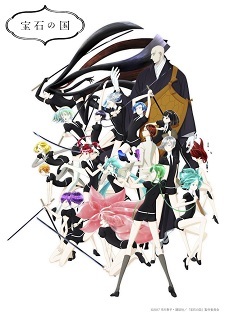 The official website of Houseki no Kuni has revamped and announced the cast and additional staff members for the TV series, as well as a new preview. The anime will air on Saturdays at 9:30 p.m. starting on October 7 on AT-X, followed by Tokyo MX, BS11, and MBS. First three episodes of the anime will be pre-screened at an event on September 24 at Toho Cinemas Roppongi Hills where Tomoy Kurosawa (Phosphophyllite), Mikako Komatsu (Cinnabar), Ai Kayano (Diamond), Ayane Sakura (Bort), and Takahiko Kyougoku (Director) will appear for a two-part talk show. I don't like CGI at all, specially in anime, but this is very decent. That's not water, it's mercury. Oh, really? Because I remember that kind of "silver water" also present in F/S N by ufotable when they're trying to create water with CG. If that's actually a mercury in this case, then it looks as good as the real mercury. Pretty good CGI with horrible character designs and bad lighting. The character design is about the same with any other Polygon's design(which is not necessarily good). It's not that rare in CG anime. Bad lighting? Or bad colour palette? Just going to address the lighting thing. Yeah, I should have said color palette instead. I thought it was an eyesore half the time. And no the character design is not anything similar to polygon pictures. Ajin actually has realistic body proportions. While this show does not. Also, all images were from both the original Ajin PV and this shows PV. Also, excuse my laziness I have college tomorrow and need to sleep. So I kinda just threw it together. The designs aren't realistic because their designs in the manga weren't realistic? The show has to capture the style of Ichikawa, which is graceful and shoujo-like. Making it realistic like Ajin wouldn't make any sense because that's not what the manga looked like. Plus the "graceful" style fits HNK more than Ajin becuase it's story isn't grounded in some kind of reality like Ajin. Most opinions actually contain some bias lol. In fact, human beings as creatures are biased. I think the character designs in this PV are bad because their legs are extremely long and I find it funny. It really is just that simple. My opinion was biased, yes but so is someone else who says the like it. Sure. Human beings also change & usually get wiser as they get older, so, again, I am pretty optimistic you will eventually learn the difference between bias & opinion. It's nice chatting with you. Goodbye. Talking about age like that and not having one on your profile makes it seem like you are self-conscious. Just because I dislike the style and you don't, doesn't make my opinion any less biased than yours. You dropped Yona one episode in called it bad and said you didn't enjoy it. If that isn't bias then I don't know what is. Humans cannot be unbiased. We are different by nature and see things completely differently. Even your opinion of me is biased. @TheServant Well duh. Isn't it obvious that my statement is just my opinion. That is literally how everything works. Everything that said by someone is always considered as opinion/subjective, but there's different between biased opinion or not. It seems you do not understand that. Well, I am sure you will learn the difference as you get older & wiser. @millo I feel you may have just gotten out of an abusive relationship. And for that I am sorry. I mean as TheServant said... yeah, just calm down because being fairly clear you're kind of jumping into conclusions here @millo . Alright. Just calm down there. But well the mangaka of Houseki no Kuni, Haruko Ichikawa is a big inspiration to me, she's my idol and im sooo pissed when i read his comment. I see, so what you meant by "horrible character designs" was the less-realistic nature, not the less-detailed nature of CG anime. If so, then judging character design by how realistic it is not really a good way to judge. Some character designs are not made with realistic and lifelike in mind & more of how to make them unique and fit the whole theme of the story. And you prefer realistic design over others is more of a personal taste, so you cannot really call other designs horrible. It's like me and my strong preference towards old school art style in anime. I like that art style a lot, but I cannot call other art styles horrible simply because they're not old school enough(I know some do, but that's just silly). Lol, hadn't connected he's the same VA as Kirei, curious choice. Overall the CGI is not bad, though that water(I am assuming that silver liquid thing is water) is quite jarring. Definitely going to watch this one still since it's pretty atmospheric & seems pretty unique. The CGI and characters look great! I hope the anime will live up to my expectations. Pretty good CGI with horrible character designs and bad lighting. Will still give it a shot but my fudge those character designs are horrid. I have to appreciate an honest anime that stacks all the reasons not to watch it in the key visual, which saves so much effort sifting through seasonals. Making a decision not to watch it based on a single PV or image is stupid. Good GC. I'm looking forward to it. Despite the comments of the lifeless trolls haters.